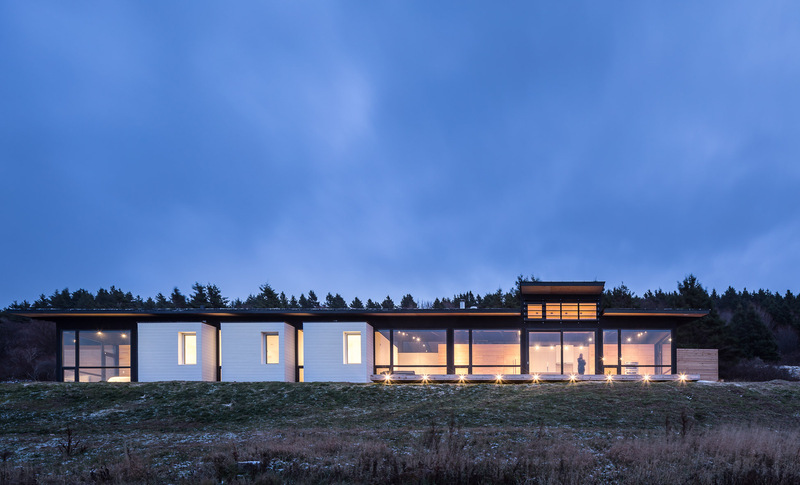 I think Canada's east coast should give Omar Gandhi a ceremonial title of some sort seeing as this Architect's name has become easily associated with some of the most stunning properties. 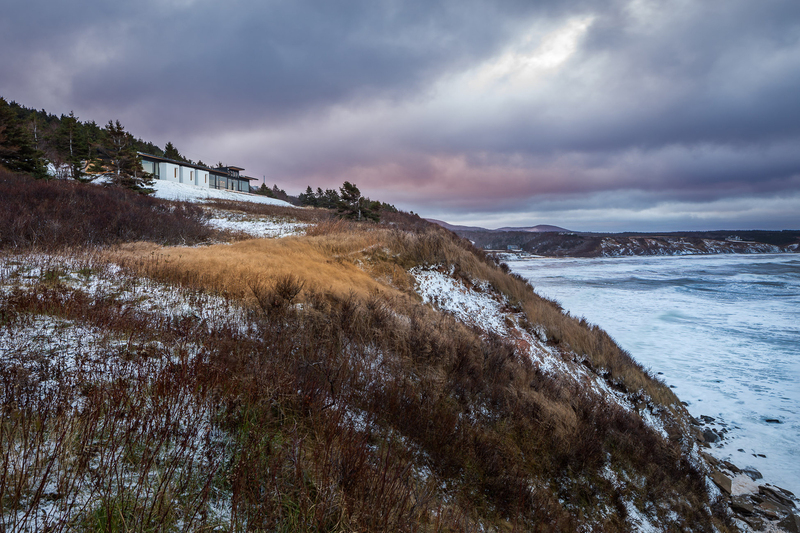 The Broad Cove Marsh Lookout is another exemplary masterpiece. 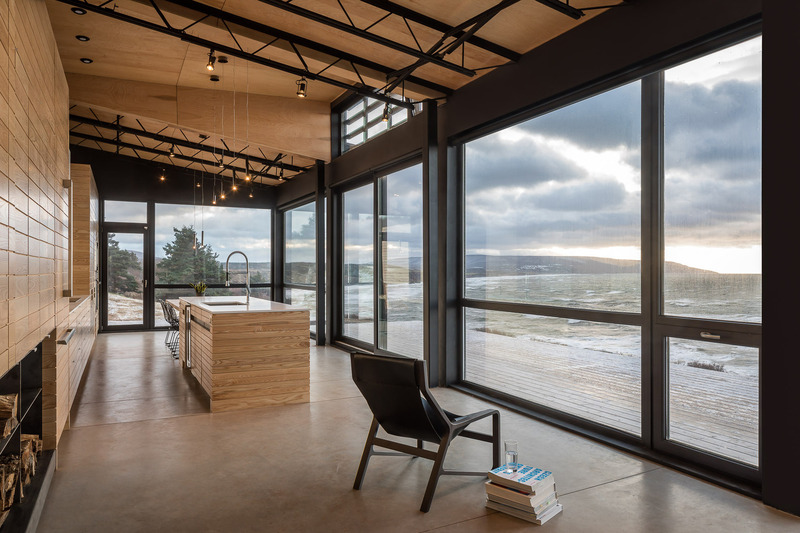 The project stands on a narrow ocean lot on the outskirts of Inverness, a coastal village on Cape Breton Island which is a popular seasonal destination for its beaches, golf courses, and hiking. Its setting affords breathtaking views of the Gulf of St. Lawrence. The design takes full advantage of the unique natural environment. The project truly earns its name Lookout since almost every element of the design is intent on framing the outdoor vistas for the occupants. The plan is laid out along the bluff's edge, giving a slice of view to each space in the house. The southern sea-facing facade features unobstructed views of the water with floor-to-ceiling windows. 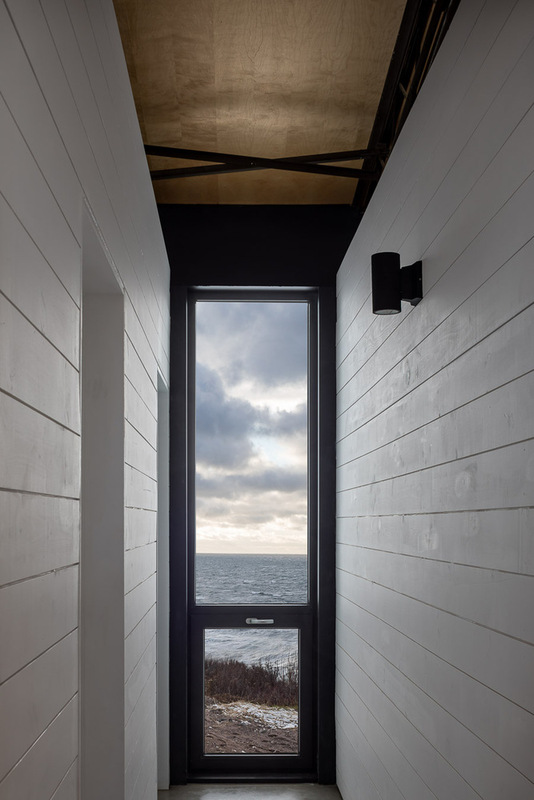 The cabin is capped with a simple shed roof that slopes towards the sea, again, drawing the eyes towards the focal point of the ocean view. This also serves to keep out the hotter high-angle summer sun during those hot times of the year. 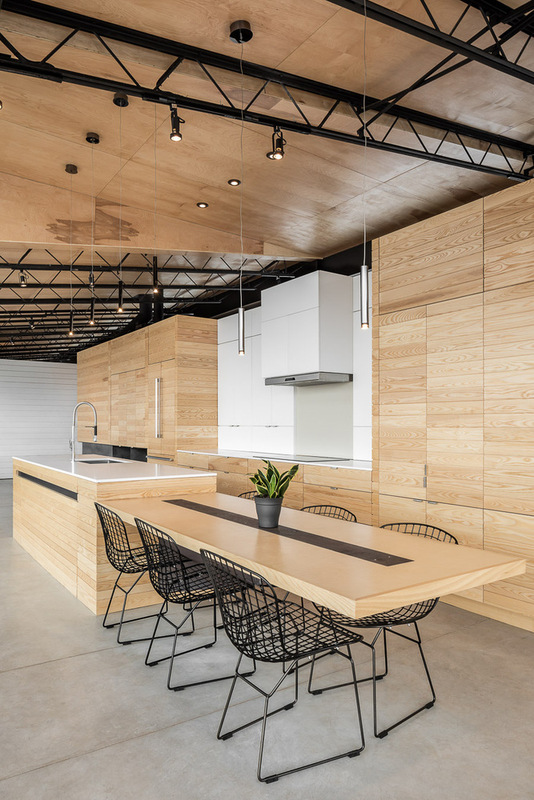 A section of the roof is raised like an open cassette deck and this punctuates the kitchen space with a bit more light (the glazing here features a simple brise-soleil). 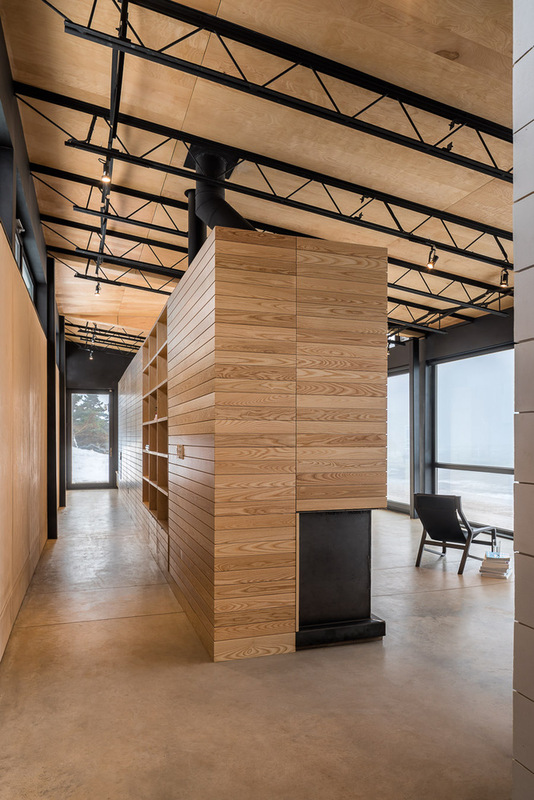 The facade has three box bays clad in local white spruce boarding that contrasts starkly with the more prevalent concrete, black steel and glass, creating a visually-arresting rhythm to the exterior. The interior of the house is minimal, featuring an open living space (earmarked by a 5.5-metre long kitchen island) and well-demarcated private spaces. The finishing include concrete flooring, lightly coloured millwork, and black metal accents. The simple palette keeps the focus on the ever-changing elemental vista. The layout is split by a plywood unit that runs the length of the home and even extends outdoors, creating defined points of egress with ample storage. The northern facade faces the road, with a linear concrete plinth that anchors the house to its site, seemingly afraid that it may trot off into the waves. A long clerestory strip sits above the plinth to allow soft passive light into the circulation corridor. Omar Gandhi never misses an opportunity to celebrate a superb vista, allowing it to take centre stage with a modern simple space plan. With nature being framed like this, how could you resist embracing it? The pictures were beautifully captured by Doublespace Photography.